Eco-athletes—sports figures who take on environmental issues—are a rare breed as compared to athletes who get involved with causes like cancer, domestic violence, and, increasingly, racism. There are several oft-cited reasons: environmental topics can be overly complex; the political nature of “green” issues can be daunting to some athletes; and the relative lack of financial muscle behind environmental causes means athletes often look to those that are better funded. But there are athletes who, despite the obstacles, take a strong stand on behalf of environmental issues. 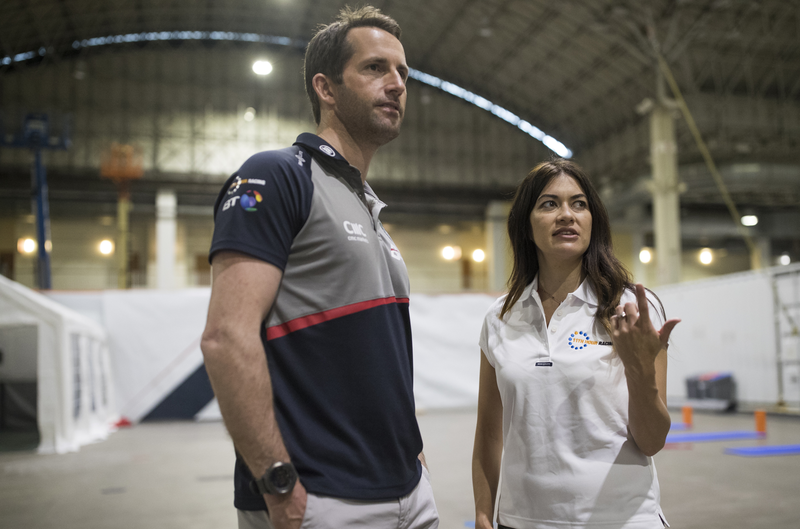 Two such eco-athletes, Sir Ben Ainslie, skipper of Land Rover BAR, Britain’s challenger for the 35th America’s Cup, and Leilani Münter, the self-described “Eco, Vegan, Hippie Chick with a race car,” met up at an America’s Cup prep race in Chicago in June. They shared the challenges and opportunities around making their sports and teams more sustainable; why sustainability, the environment and climate change resonate with them; and how they can potentially learn from each other. Sir Ben Ainslie is a man with a laser-like focus. That focus helped him win sailing gold medals in four straight Olympics and an America’s Cup in 2013 as a member of Oracle Team USA. It is serving him and his team well as he navigates the marathon of training, prep races and finals in his attempt to win Great Britain’s first-ever America’s Cup in 2017 as skipper of the Land Rover BAR team. But Sir Ben and his equally focused team took a break from training this spring. The squad took in Racing Extinction, the powerful 2015 documentary film that, well, focused attention on the issues of endangered species and mass extinction. These issues are powerful, life affirming motivators for Leilani Münter, the “eco-vegan-hippie chick with a race car” and an on-camera presence in the film. Sir Ben and the team were moved by the movie—they are supporting the film’s “#StartWith1Thing” challenge, encouraging individuals to take environmental action—and found common cause with Ms. Münter. You see, Land Rover BAR is going for an unprecedented double: win the America’s Cup while, with the help of Exclusive Sustainability Partner 11th Hour Racing, becoming the most sustainable sports team in the UK and beyond. So when 11th Hour Racing invited Ms. Münter to speak at a public screening of “Racing Extinction” as part of the festivities surrounding the Louis Vuitton America’s Cup World Series races in Chicago in June, a meeting with Sir Ben became a foregone conclusion. That the Land Rover BAR skipper cited her as the inspiration for the team’s move to Meatless Mondays made Ms. Münter’s day. “This makes me so happy!” exclaimed the pioneering eco-stock and Indy car driver. 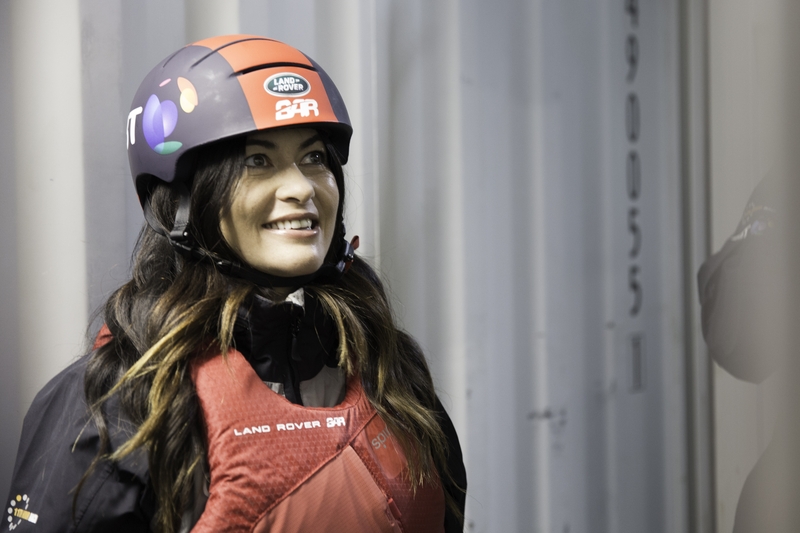 She believes that Land Rover BAR’s high global profile will help plant environmental action seeds in the sailing community and other sports. The Sir Ben-Leilani Münter conversation covered more than Meatless Mondays, including the common ground sailing and auto-racing share in terms of reducing emissions as well as waste. Ms. Münter added that, given Indy cars, like America’s Cup boats are also made of carbon fiber, she hopes to see sailing and auto-racing governing bodies provide encouragement and incentives to teams to recycle carbon fiber boats and race cars at end of life. Preserving endangered species was another topic that animated both Sir Ben and Ms. Münter. Ms. Münter takes a more macro, multi-media approach to species preservation, bringing attention to the issue through her film work in Racing Extinction, as well as in writing—her powerful article about the threat of immediate extinction facing the very last Rabbs Fringe-limbed Tree Frog was featured in The Huffington Post. Her advocacy for the vegan lifestyle, solar power, and electric cars comes through in her public speaking appearances. This was on display at the recent “Climate and Sports Roundtable,” hosted by the White House Office Office of Science and Technology Policy, at which she touted the benefits of the vegan lifestyle. Not surprisingly, Leilani Münter “walks the ‘eco, vegan’ walk” in her personal life: The solar panels on the roof of her home provide enough clean energy to power not only her home but also her fully electric Tesla Model S.
If it’s not obvious already, one more thing these two racers share is a willingness; a need to push the envelope. This is the case, no matter if the subject is preserving endangered species or figuring out how to go a couple of millimeters per second faster than before. And so it was that Eco-Vegan-Hippy Chick with a Race Car got to experience America’s Cup racing up close as she served as Land Rover BAR’s honorary “6th Man” (a guest who’s on board the boat during the actual race alongside the 5-man crew) on one of the two days of America’s Cup World Series racing in Chicago. For his part, Sir Ben was impressed: “It’s tough to be a guest racing on-board the foiling (when the boat is going so fast it literally rises above the surface of the water by 2-3 feet) AC45s – but Leilani did great.” Land Rover BAR also did well, finishing in 2nd place in the field of six behind Artemis Racing of Sweden in Chicago. As turnabout is fair play, Sir Ben has an open invitation to visit Ms. Münter at her Charlotte, NC home base for a vegan meal and a turn at the wheel of her EV. Of course that might have to wait at least until July 2017 because, between now and then, Sir Ben will be busy training with his Land Rover BAR team and contesting the remaining America’s Cup World Series races^ in the run up to its final push to win the 35th America’s Cup in Bermuda next spring in as sustainable a fashion as possible. You can follow Land Rover BAR’s sustainability efforts via #RaisingTheBAR. A smart building management system now monitors energy and water consumption, and renewable energy generation.at the team’s new home in Portsmouth. Since moving to the team base, 100% of electricity is from renewable sources, 21% of which was generated by the team’s Low Carbon PV panels saving 201 tonnes of CO2e. Waste from the team base was reduced by 52% between 3rd and 4th quarter, 2015. First sports team in the UK to achieve the international ISO20121 certification for sustainable events across all its activities. 9m2 of artificial reef and oyster cages were installed with support from Base Supplier MDL to encourage an increased population of oysters in the Solent region. Testing a new, cleaner, more efficient process to recycle carbon fiber from its resin composite. Creation of first life cycle model for manufacture of test and race boats, to be converted into a marine industry tool with help of Title and Innovation Partner Land Rover. Developed in tandem with Exclusive Technology in Sustainability Partner, BT, the “Virtual Chase” boat will save approximately 0.8 tonnes CO2e per person remaining in Mission Control. 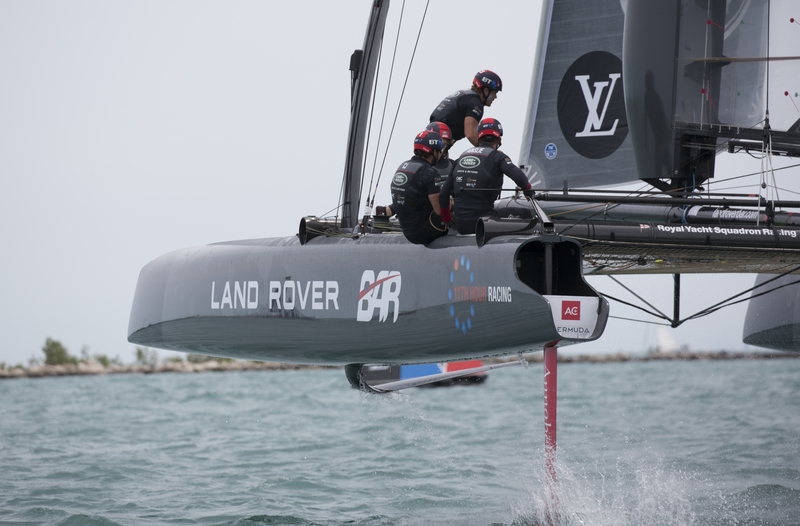 ^ Following Chicago, Land Rover BAR won the America’s Cup World Series race in its home base of Portsmouth, England. The team came in 3rd at last weekend’s event in Toulon, France and is in first place in the America’s Cup World Series overall with one more prep race to go in Japan, November 18-20. Points earned in the America’s Cup World Series will count towards the America’s Cup Finals in Bermuda next June.